This is in response to the weekly Photo Challenge: Fun. Woohoo! 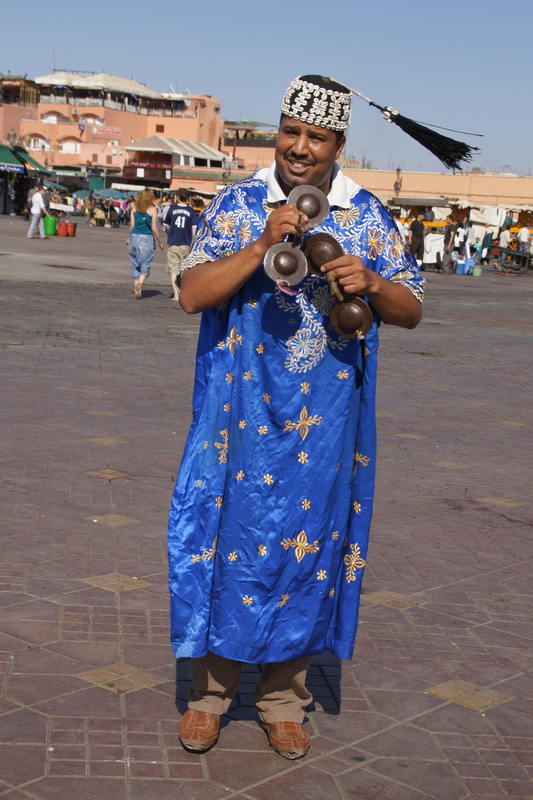 Tassel flying and symbols clanging, this gentleman was spreading the fun in the Jemma el Fna Square in Marrakesh, Morocco. 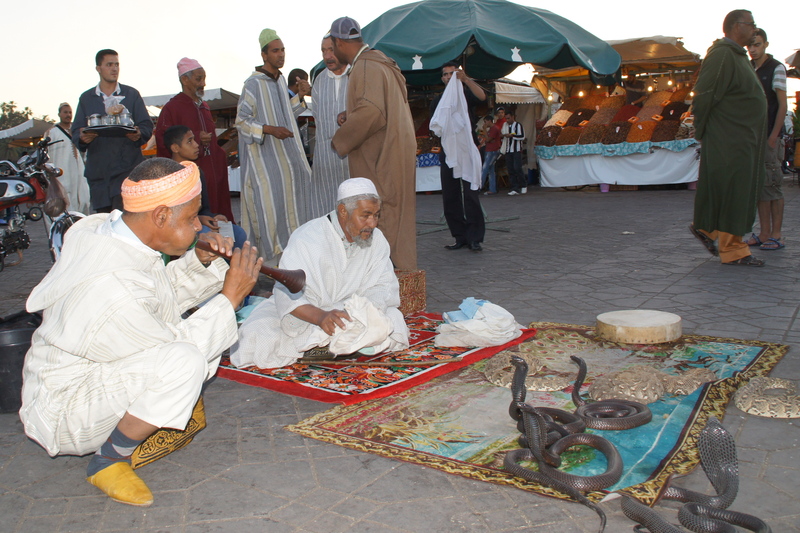 Jemaa el Fna, the main square in Marrakesh, Morocco becomes a sea of humanity when snake charmers, musicians, henna tattoo artists, food vendors and crowds of shoppers and diners converge on the square around sunset. 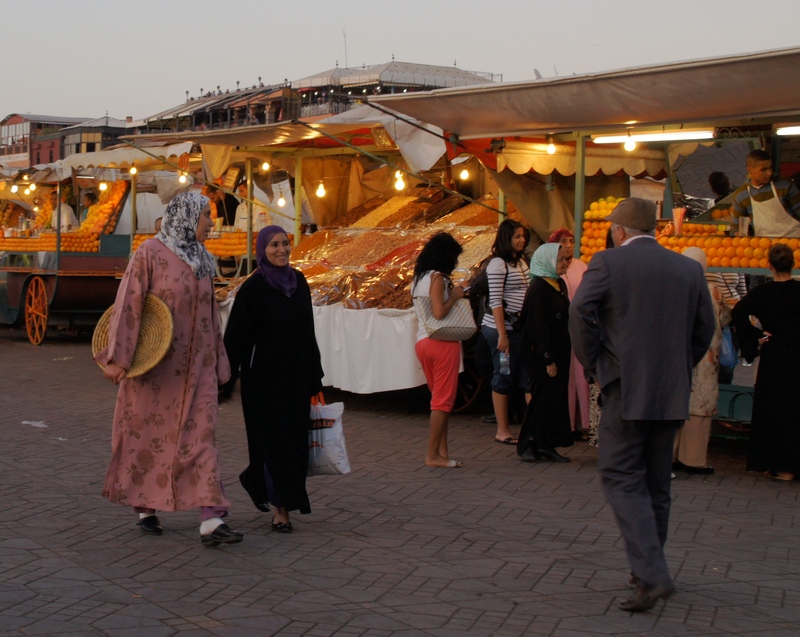 Are You a Travel Snob? Take this quiz and find out. Camel trekking in Morocco? Ten points! 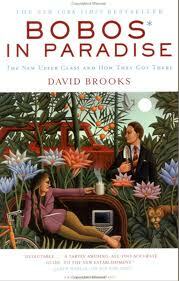 During one of our recent “What is the world coming to?” discussions spurred by politics and other recent disasters, a friend handed me a book by David Brooks called Bobos in Paradise: The New Upper Class and How They Got There. In it, Brooks, who is a columnist for the New York Times, examines a social group that he has labeled bourgeois bohemians, or Bobos. He says a Bobo is a mix of bourgeois establishment square and bohemian artist intellectual. Like an anthropologist studying an exotic tribe, Brooks looks at Bobo business culture, social, intellectual and spiritual life. It’s a fun read because he seems like good-natured guy who admits he’s part of this group and doesn’t hesitate to point out its idiosyncrasies in a very humorous way. But, we’re all travel snobs to some extent. For example, I was accused of travel snobbery when I said I didn’t really have a great desire to visit the Wisconsin Dells for vacation. I also make snide comments about the oddly dressed tourists who pile off cruise ships and tour buses. But it’s a matter of degree. I definitely rate myself lower on the food chain of travel snootiness than the guy who rues the day electrification came to Belize, though I have told people I remember when the streets weren’t paved on Ambergris Caye. Where do you rate on the travel snob-o-meter? With the help of Brooks analysis, I’ve developed the following quiz so you can rate yourself. Give yourself 10 points if you answer yes to the following: 1. 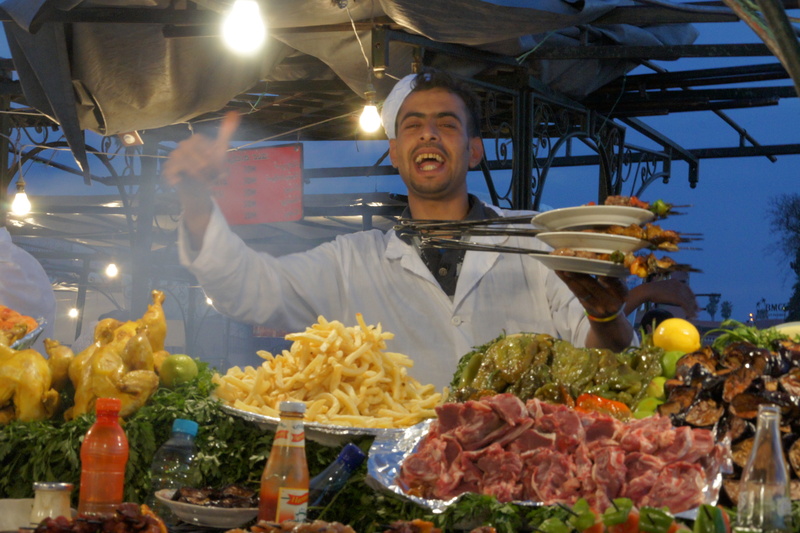 Have you ever one-upped someone in a travel conversation? 2. Do you avoid places that are “touristy” even though you’re dying to see them? 3. Do you wear outdoorsy travel gear acquired at places such as Eddie Bauer or REI even when you’re not on an expedition? Five extra points if your togs have lots of pockets. 4. Have you ever said you have a language instead of I speak a language? Or, another of my favorites, do you use a “French” pronunciation for a word when it isn’t a French word? 6. Do you seek out locales where simple peasants live in abundance farming or creating folk art? 7. Do you frequently mention using alternative modes of transportation, such as camels or tuk-tuks? 8. What’s that you say? You don’t travel because there’s no place that’s better than right where you are? If you say yes, you’re a reverse travel snob. Bam! 10 points. Finally, does your idea of a great vacation involve pain and exertion– for example biking across a state larger than Rhode Island, or kayaking around Lake Superior or canoeing length of the Amazon? If your answer is yes, award yourself 20 points. “At the tippy top of the leisure status system are those vacations that involve endless amounts of agony and pain,” says Brooks. Here’s how you stack up. 10 points: not a travel snob, but a little dull. 20-50 points: emerging snob, you just need to add on a few more miles, perhaps while trekking in Nepal. 60-80 points: You’re a snooty pants, and I’m sure those pants are made by Patagonia. And you’re probably a Bobo, too. 90-100 points: You’re an insufferable travel snob. We’d all like to go where you’ve been, but we don’t want you to tell us about it, so go kayak around Lac Superieur.